Clean, CARFAX 1-Owner. 2.5 SV trim, Super Black exterior and Charcoal interior. EPA 38 MPG Hwy/27 MPG City! Moonroof, Satellite Radio, iPod/MP3 Input, Back-Up Camera, [K01] CONVENIENCE PACKAGE, Aluminum Wheels. AND MORE! Back-Up Camera, Satellite Radio, iPod/MP3 Input MP3 Player, Aluminum Wheels, Keyless Entry, Remote Trunk Release, Child Safety Locks, Steering Wheel Controls, Electronic Stability Control. CONVENIENCE PACKAGE rear passenger A/C vents, and mood lamp in roof console, Auto-Dimming Rear View Mirror, Manual Folding Outside Mirrors, LED turn signals, HomeLink Universal Transceiver, Power Sliding Moonroof w/Tilt, Compass, Side Cargo Net, Front Passenger Window w/1-Touch Auto-Up/Down, auto reverse feature. Nissan 2.5 SV with Super Black exterior and Charcoal interior features a 4 Cylinder Engine with 182 HP at 6000 RPM*. Serviced here, Free Vehicle History Report, Local Trade, Remote Start, Just Arrived, New Windshield Wipers. Just Arrived, CARFAX 1-Owner. Gun Metallic exterior and Charcoal interior, 2.5 SV trim. PRICED TO MOVE $1,600 below NADA Retail!, FUEL EFFICIENT 39 MPG Hwy/27 MPG City! Satellite Radio, iPod/MP3 Input, Aluminum Wheels, Back-Up Camera. CLICK NOW! Back-Up Camera, Satellite Radio, iPod/MP3 Input. MP3 Player, Aluminum Wheels, Remote Trunk Release, Keyless Entry, Steering Wheel Controls, Child Safety Locks, Electronic Stability Control. Nissan 2.5 SV with Gun Metallic exterior and Charcoal interior features a 4 Cylinder Engine with 179 HP at 6000 RPM*. Serviced here, Free Vehicle History Report, Remote Start, Just Arrived, New Windshield Wipers, CLEAN CARFAX. This Altima is priced $1,600 below NADA Retail. This vehicle is located at Gates Nissan of Richmond. 4098 Atwood Dr. Richmond KY 40475 Pricing analysis performed on 3/23/2019. Horsepower calculations based on trim engine configuration. Fuel economy calculations based on original manufacturer data for trim engine configuration. Please confirm the accuracy of the included equipment by calling us prior to purchase. CARFAX 1-Owner, Just Arrived. Super Black exterior and Charcoal interior, 2.5 SV trim. PRICED TO MOVE $1,400 below NADA Retail!, EPA 39 MPG Hwy/27 MPG City! Satellite Radio, iPod/MP3 Input, Aluminum Wheels, Back-Up Camera READ MORE! Back-Up Camera, Satellite Radio, iPod/MP3 Input. MP3 Player, Aluminum Wheels, Keyless Entry, Remote Trunk Release, Child Safety Locks, Steering Wheel Controls, Electronic Stability Control. Nissan 2.5 SV with Super Black exterior and Charcoal interior features a 4 Cylinder Engine with 179 HP at 6000 RPM*. Serviced here, Free Vehicle History Report, Remote Start, Just Arrived, New Windshield Wipers, CLEAN CARFAX. If you're looking for a comfortable and stylish family sedan whose price is as reliable as is its reputation for value, reliability and resale, the 2017 Nissan Altima is the antidote to more mainstream family sedans like the Honda Accord and Toyota Camry. -KBB.com. Great Gas Mileage: 39 MPG Hwy. This Altima is priced $1,400 below NADA Retail. CARFAX 1-Owner, Just Arrived. EPA 39 MPG Hwy/27 MPG City!, $1,400 below NADA Retail! 2.5 SV trim, Pearl White exterior and Charcoal interior. Satellite Radio, iPod/MP3 Input, Aluminum Wheels, Back-Up Camera. SEE MORE! Back-Up Camera, Satellite Radio, iPod/MP3 Input MP3 Player, Aluminum Wheels, Remote Trunk Release, Keyless Entry, Steering Wheel Controls, Child Safety Locks, Electronic Stability Control. Nissan 2.5 SV with Pearl White exterior and Charcoal interior features a 4 Cylinder Engine with 179 HP at 6000 RPM*. Serviced here, Free Vehicle History Report, Remote Start, Just Arrived, New Windshield Wipers, CLEAN CARFAX. KBB.com's review says If you're looking for a comfortable and stylish family sedan whose price is as reliable as is its reputation for value, reliability and resale, the 2017 Nissan Altima is the antidote to more mainstream family sedans like the Honda Accord and Toyota Camry.. Great Gas Mileage: 39 MPG Hwy. CARFAX 1-Owner, Extra Clean, ONLY 30,215 Miles! Brilliant Silver exterior and Sport Interior interior. FUEL EFFICIENT 37 MPG Hwy/26 MPG City! iPod/MP3 Input, Bluetooth, Back-Up Camera, [S01] LED APPEARANCE PACKAGE, Alloy Wheels AND MORE! LED APPEARANCE PACKAGE LED Signature Daytime Running Lights, LED Low Beam Headlights. Nissan 2.5 SR with Brilliant Silver exterior and Sport Interior interior features a 4 Cylinder Engine with 179 HP at 6000 RPM*. Serviced here, Non-Smoker vehicle, Originally bought here, Free Vehicle History Report, Local Trade, Just Arrived, New Windshield Wipers, CLEAN CARFAX. 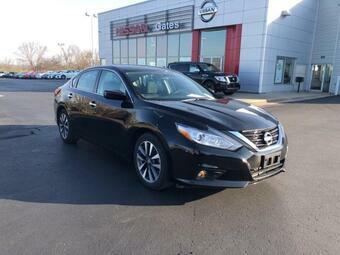 KBB.com's review says If you're looking for a comfortable and stylish family sedan whose price is as reliable as is its reputation for value, reliability and resale, the 2017 Nissan Altima is the antidote to more mainstream family sedans like the Honda Accord and Toyota Camry.. Great Gas Mileage: 37 MPG Hwy. CARFAX 1-Owner, Clean. EPA 38 MPG Hwy/27 MPG City!, $900 below NADA Retail! 2.5 S trim, SUPER BLACK exterior and Charcoal interior. iPod/MP3 Input, Bluetooth, [X01] S CONVENIENCE PACKAGE, Back-Up Camera. AND MORE! S CONVENIENCE PACKAGE: Remote Engine Start, 6-Way Power Driver's Seat. Nissan 2.5 S with SUPER BLACK exterior and Charcoal interior features a 4 Cylinder Engine with 179 HP at 6000 RPM*. Serviced here, Originally bought here, Free Vehicle History Report, Remote Start, Nissan Certified Pre-Owned Inspection, New Windshield Wipers, CLEAN CARFAX. This Altima is priced $900 below NADA Retail. This vehicle is located at Gates Nissan of Richmond. 4098 Atwood Dr. Richmond KY 40475 Pricing analysis performed on 3/30/2019. Horsepower calculations based on trim engine configuration. Fuel economy calculations based on original manufacturer data for trim engine configuration. Please confirm the accuracy of the included equipment by calling us prior to purchase. PRICED TO MOVE $1,000 below NADA Retail!, EPA 39 MPG Hwy/27 MPG City! CARFAX 1-Owner, Clean, LOW MILES - 26,966! Nav System, Moonroof, Heated Leather Seats, Back-Up Camera, [U02] 2.5 TECHNOLOGY PACKAGE, [J01] MOONROOF PACKAGE CLICK NOW! Leather Seats, Heated Driver Seat, Back-Up Camera Aluminum Wheels, Remote Trunk Release, Keyless Entry, Steering Wheel Controls, Child Safety Locks, Heated Mirrors, Electronic Stability Control. 2.5 TECHNOLOGY PACKAGE NissanConnect Services, automatic collision notification, remote startvia smartphone, emergency call, stolen vehicle locator, and dealer service scheduling and maintenance alerts, NissanConnect w/Navigation & Mobile Apps, 7 color display, touch screen and Nissan voice recognition for navigation and audio, Predictive Forward Collision Warning (PFCW), Forward Emergency Braking (FEB), Intelligent Cruise Control (ICC), MOONROOF PACKAGE Power Sliding Moonroof w/Tilt. Nissan 2.5 SL with Pearl White exterior and Beige interior features a 4 Cylinder Engine with 182 HP at 6000 RPM*. Serviced here, Free Vehicle History Report, Remote Start, New Windshield Wipers, CLEAN CARFAX. This Altima is priced $1,000 below NADA Retail. CARFAX 1-Owner. GUN METALLIC exterior and Charcoal interior, 2.5 S trim. JUST REPRICED FROM $14,890, PRICED TO MOVE $1,100 below NADA Retail!, EPA 38 MPG Hwy/27 MPG City! Bluetooth, Back-Up Camera, [X01] S CONVENIENCE PACKAGE. AND MORE! Back-Up Camera, Bluetooth MP3 Player, iPod Input, Remote Trunk Release, Keyless Entry, Steering Wheel Controls. Reduced from $14,890. This Altima is priced $1,100 below NADA Retail. This vehicle is located at Toyota South 961 Four Mile Rd Richmond KY 40475 Pricing analysis performed on 4/15/2019. Horsepower calculations based on trim engine configuration. Fuel economy calculations based on original manufacturer data for trim engine configuration. Please confirm the accuracy of the included equipment by calling us prior to purchase. CARFAX 1-Owner. 2.5 S trim, BRILLIANT SILVE exterior and Charcoal interior. EPA 39 MPG Hwy/27 MPG City! Bluetooth, Keyless Start, [X01] POWER DRIVER SEAT PACKAGE, Back-Up Camera. CLICK NOW! Back-Up Camera, Bluetooth, Keyless Start MP3 Player, iPod Input, Remote Trunk Release, Keyless Entry, Steering Wheel Controls. POWER DRIVER SEAT PACKAGE 6-Way Power Driver's Seat. Nissan 2.5 S with BRILLIANT SILVE exterior and Charcoal interior features a 4 Cylinder Engine with 179 HP at 6000 RPM*. 2.5 SV trim. CARFAX 1-Owner. FUEL EFFICIENT 39 MPG Hwy/27 MPG City! Dual Zone Climate Control, Remote Engine Start, Blind Spot Monitor, Cross-Traffic Alert, Back-Up Camera, Aluminum Wheels, Bluetooth, Satellite Radio. CLICK NOW! Back-Up Camera, Satellite Radio, Bluetooth, Aluminum Wheels, Remote Engine Start, Dual Zone Climate Control, Cross-Traffic Alert, Blind Spot Monitor. MP3 Player, iPod Input, Keyless Entry, Remote Trunk Release, Child Safety Locks. Nissan 2.5 SV with PEARL WHITE exterior and Charcoal interior features a 4 Cylinder Engine with 179 HP at 6000 RPM*. PEARL WHITE exterior and Sport Interior interior, 2.5 SR trim. CARFAX 1-Owner, LOW MILES - 23,523! FUEL EFFICIENT 37 MPG Hwy/26 MPG City! Back-Up Camera, Bluetooth, [K02] MIDNIGHT EDITION PACKAGE, Aluminum Wheels. CLICK NOW! Back-Up Camera, Bluetooth, Aluminum Wheels. MP3 Player, iPod Input, Remote Trunk Release, Keyless Entry, Child Safety Locks. MIDNIGHT EDITION PACKAGE Black Mirror Caps, LED Headlamps w/Signature, Black Spoiler, Remote Engine Start, Wheels: 18 Exclusive Midnight Black. Nissan 2.5 SR with PEARL WHITE exterior and Sport Interior interior features a 4 Cylinder Engine with 179 HP at 6000 RPM*. 1 Owner Clean CarFax, No Accident or Damage Reported, We Did A 182 Multi-Point Inspection, Balanced & Rotated Tires, 4-Wheel Alignment. Clean. Bluetooth, CD Player, Keyless Start, Power Seat, Back-Up Camera, iPod/MP3 Input, Serviced Here,Call To Set Up Your Test Drive (859)779-1000. Back-Up Camera, iPod/MP3 Input, Bluetooth, CD Player, Keyless Start. MP3 Player, Keyless Entry, Remote Trunk Release, Steering Wheel Controls, Child Safety Locks. POWER DRIVER SEAT PACKAGE 6-Way Power Driver's Seat. Nissan 2.5 S with Gun Metallic exterior and Charcoal interior features a 4 Cylinder Engine with 179 HP at 6000 RPM*. 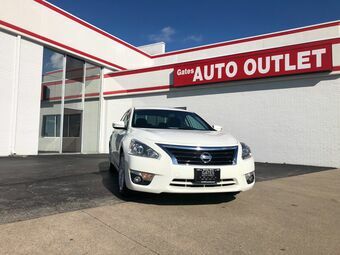 Nav System, Moonroof, Heated Leather Seats, Premium Sound System, Dual Zone A/C, Cross-Traffic Alert, Blind Spot Monitor, [R10] REAR SPOILER, [J01] MOONROOF PACKAGE, [U03] 2.5 TECHNOLOGY W/LED PACKAGE, Back-Up Camera, Aluminum Wheels. Leather Seats, Heated Driver Seat, Back-Up Camera, Premium Sound System, Aluminum Wheels, Dual Zone A/C, Blind Spot Monitor, Cross-Traffic Alert, Heated Seats, Heated Leather Seats Remote Trunk Release, Keyless Entry, Steering Wheel Controls, Child Safety Locks, Heated Mirrors. 2.5 TECHNOLOGY W/LED PACKAGE smoked headlight housing, NissanConnect Services, automatic collision notification, remote startvia smartphone, emergency call, stolen vehicle locator, and dealer service scheduling and maintenance alerts, NissanConnect w/Navigation & Mobile Apps, 7 color display, touch screen and Nissan voice recognition for navigation and audio, Predictive Forward Collision Warning (PFCW), Forward Emergency Braking (FEB), Intelligent Cruise Control (ICC), LED Signature Daytime Running Lights, LED Low Beam Headlights, SiriusXM Traffic & Travel Link, one-shot destination entry w/voice recognition, MOONROOF PACKAGE Power Sliding Moonroof w/Tilt, REAR SPOILER. Nissan 2.5 SL with PEARL WHITE exterior and Charcoal interior features a 4 Cylinder Engine with 182 HP at 6000 RPM*.